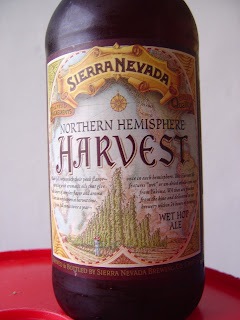 Today I'm drinking Northern Hemisphere 2010 Harvest Wet Hop Ale brewed by Sierra Nevada Brewing Company in Chico, California. Wet hops refer to hops that are used immediately after being picked, no drying. 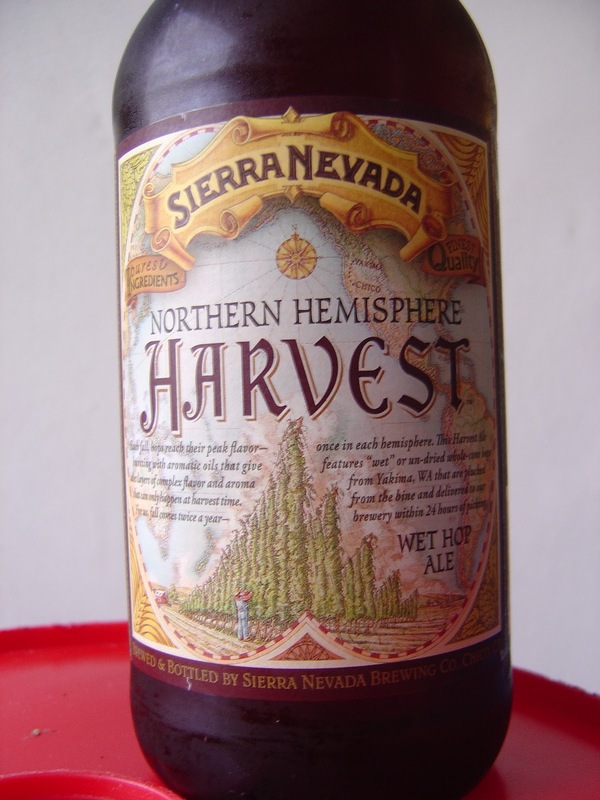 In this case, the hops are picked in Yakima, Washington, and used within 24 hours. There is a nice little story (little font too) on the front label that describes the process. In the story, they refer to hops being "plucked from the bine", a word even this Google spell-checker doesn't like. Luckily, my lust to correct them to (in my mind the obviously correct) "hop vine" was limited to one simple remark on Twitter. Also luckily, online friend Karlis nicely told me that these guys had it correct, not me. Probably wont be the last time, either! Anyway, here's some science for you smarties. So I made my apology to the brewery, and I had a good laugh with myself. Good thing for the timely correction, too. I had already typed out a whole bit about proofreading and the mistake being unfortunate, followed by my suggestion that whoever wrote the copy had the same trouble distinguishing B's and V's as my ESL Colombian wife. Followed by my suggestion that Sierra Nevada was "punk"ing us to see who would notice first and asking what my prize was. Basically you see where this was going! Whew! In the end, who of you already knew hops grow on bines? And who learned something today? You see, I am here for you! The label is beautiful as usual, with a map theme and rows of hop bines illustrated on a giant 24 ounce bottle. Time to crack this thing open. Very fresh aroma. Hoppy, spicy, malty, bready, all in one whiff. Spicy and bitter, peppery flavor start. There is a nice malty bread balance right away though. Wow, what a delicious citrus orange and lemon flavor comes next. Zesty rindy rind zest, or something like that. Some pine and a bit of stickiness start to enter toward the end. Refreshingly bitter. The 6.7% alcohol is not really a factor, though I enjoy how it enhances the citrus flavors a bit. Hot Damn! This is already gone? All 24 ounces? Yep! Terrific beer. If you see it, buy it and drink promptly as freshness does not age well. Later dudes and dudettes! Beer Hops 10 Seeds- Humulus lupulus - Exotic! If you enjoyed this review or want to take a chance that I could do better tomorrow, consider subscribing to new content here. One email each morning with fresh scintillating commentary. There are also several buttons below to share this with your friends if you so choose. Thanks so much! Yo. The pictures are OK but not my normal spectacularity. Today was a rainy 50 degree miserable day and the sun didn't show one second. Therefore, these pictures took place on a Firehouse Subs pickle barrel in my garage, almost in the dark. Ya dig?